The EN allows Partners to eliminate dual entry into their databases and RCRAInfo. EN flows are more automated than RCRA Translator. The EN allows Partners to retrieve data from RCRAInfo in a more seamless manner. All modules are ready to use, except biennial reporting. Unless a Partner is a direct user (i.e., doesn’t have its own data system) and intends to stay that way, they should begin implementing the RCRA modules. Partners may want to start with Handler, which is the oldest and most stable module and which typically accounts for the largest volume of data. Partners already flowing data for one module (e.g., Handler) should look to implement other modules that make business sense. Partners performing flat file translation should seek an EN option in anticipation of EPA’s elimination of support of the flat file data entry option. The figure presents the current options for flowing data. 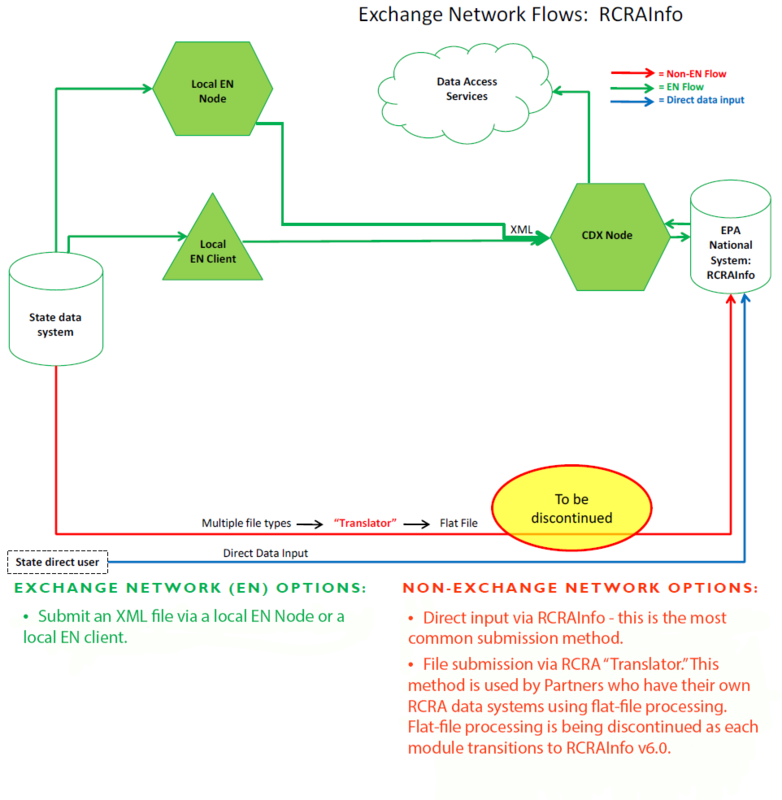 Exchange Network (EN) flow options are shown in green and non-EN options are shown in red. The RCRAInfo Flow supports all RCRAInfo modules, except Biennial Report for inbound and outbound services. There are a variety of options for submitting data to RCRAInfo. Some Partners with their own hazardous waste program information systems are currently using the Exchange Network. Others with their own systems use the legacy Translator service or double enter data into their own system and RCRAInfo. Partners that do not have their own systems enter data directly into RCRAInfo, and the Network’s bidirectional capabilities will enable them to access their programmatic data via outbound services from EPA much more easily than using RCRAInfo’s reporting features. The EPA Office of Resource Conservation and Recovery’s (ORCR) development team assists Partners who translate via flat files transition to the EN flow. Node: A Partner’s point of presence on the EN consisting of a server (hardware and software) enabled with web services that allow Partners to automatically provide and receive information via the Network and to publish data for use by other Partners. Node Client: A stand-alone application (i.e., software code) that lets Partners share data, request data, and receive results from an EN request. Clients differ from nodes in that they cannot respond to queries from other nodes and so cannot publish data. Clients also need more manual (rather than automated) steps, for example, to extract data and generate and review reports before submission. EN Services Center: A website that allows Partners to easily send, get, and download information from other Partners. The Services Center will serve as a replacement for manual submissions of information through CDX Web. It is an appropriate solution for those Partners who do not require or are not yet ready for the automation and data publishing capabilities of an EN Node. The EN Services Center is available at https://enservices.epa.gov. CDX: EPA’s Central Data Exchange. It serves as EPA’s centralized electronic report receiving system. It receives data from Partners and directs the data to EPA’s program-specific National Systems (e.g., AQS, WQX, etc.). CDX Node: CDX Node is EPA’s node on the Network, allowing EPA to receive, send, and provide information via the Network. CDX Node can also publish EPA data for use by other Partners. CDX Web (non-EN) Application: A legacy CDX application that receives data (flat file or XML format) via standard web browsers. CDX Web applications are not consistent with EN protocols (e.g., they have a separate authentication and authorization service from the EN) and typically involve more manual steps than a node-to-node exchange of data. Data Access Services: Using web services to make data available to Partners by querying nodes and returning environmental data in the form of XML documents. Published data can be accessed using a node or clients. Published data can be used in a number of ways, such as populating Web pages, synchronizing data between sites, viewing data in a Web service client, or building new sources of data into an integrated application. Direct User: A Partner entering data directly into a National Data System through a system-specific interface (manual entry). EPA National Data System: Program-specific data systems at EPA that can receive and publish data..
Local Data System: A Partner’s database or series of databases in which environmental data are stored, managed, and manipulated. XML: eXtensible Markup Language is a flexible language for creating common information formats and sharing both the format and content of data over the Internet and elsewhere. The electronic language that expresses and transports data standards and transaction sets. XML uses an extensible set of tags to describe the meaning of data.